I remain an unrepentant proponent of election-boycott as a contrivance of resisting an unjust and brutish government such as Nigeria. In the absence of embroidery, let me divulge coherent facts between the nexus of election and census. Why are we asking you not to vote? 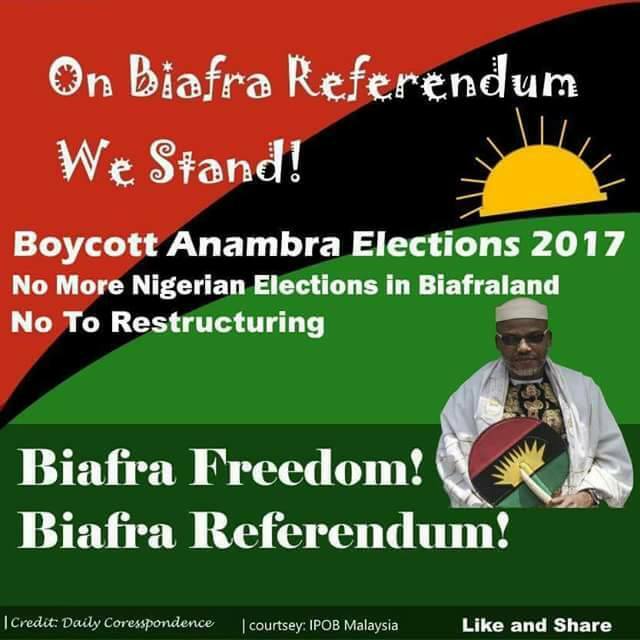 We are asking you not to vote that Biafra may come; but of course people would refer to the traitor of our time, the Judas of this very age, the Ifeajuna of our period; Uwazurike, and say "he earlier said we should not participate in census". What you boycott is election. Boycotting census is irrelevant. Of course, census is a determinant of demographic population. However, there is a very massive variation in refraining from the latter. ELECTION and CENSUS are not the same. Election is very unique because it entails giving people the consent to make decisions and laws on your behalf; in other words, giving them your mandate. By implication, the 'elected' has the permission to enact laws and implement them on your behalf. Conversely, census is just counting people 1,2,3,4,5,6,7,8... It does not matter. Even if everybody turns out for census, are you (Biafrans) not living in Sokoto, in Zamfara, in Maidugiri, in London? Are you not living in New York? Are you not living in Germany? You are scattered all over the world. You are not in your villages, so it does not really matter. These are the things you need to learn. Unless you insist that if you are resident in Kano, you are counted as a Biafran in Kano; otherwise it is off the wall. More so, election is different from census because election involves the surrendering of your mandate, submitting your power to a 'proficient candidate' for rulership. Resultantly, you would EMPLOY a ruler, courtesy of your electoral mandates, to SERVE the public; because "power belongs to the people". That is something you need to understand. 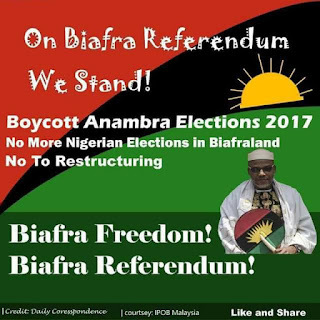 At this point, being the crux of the matter, we [Biafrans] therefore, have resorted to disobeying civil regulations/laws of the Nigerian government until they heed to our call for a REFERENDUM. Power belongs to the people, and the people have resolved to forbear from empowering their 'repressive' leaders. For eighteen good years of democracy in Nigeria, we have been voting, and there is unambiguously nothing to show forth. Don't you think we should exploit another method? Since we have known the aftermath of casting our votes [mandates], don't you think it would be worth it if we understand the efficacy of doing otherwise? We can no longer continue to entrust our future and destiny into the hands of these corrupt, greedy, impotent, and Hausa/Fulani - imposed governors in Biafraland. They collaborate with their Hausa/Fulani masters to destroy our future. If anyone rises up to oppose them politically, they try to bribe him into submission. If he or she refuses, they invite their Hausa/Fulani masters to use military force to subdue the person. More importantly, we do not intend to stop, disrupt but to BOYCOTT elections; which is simply holding aloof one's political mandate. If they threaten you with declaration of State of emergency, tell them that Operation Python Dance, Show of Force, Operation Crocodile Smile, et al, are not different from the anticipated "State of emergency". No doubt, the Independent National Electoral Commission [INEC] will mount polling boots and ballot boxes; but the status quo remains unchanged.